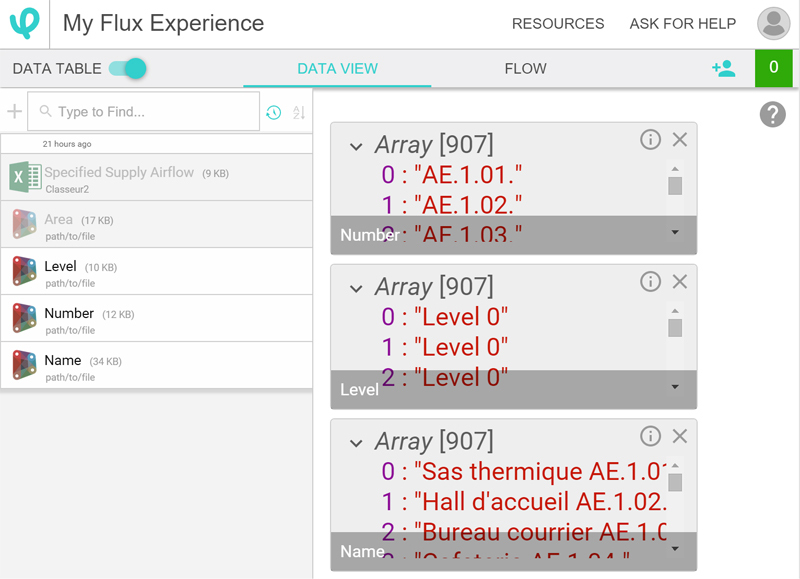 After showcasing Metro, a web-based interface for interpreting and visualizing building codes, Flux has released its new product, simply called Flux. I just had the chance to get an invitation to their beta, and I give you here the results of my first experimentation. Flux works as a central repository for exchanging data between Grasshopper, Excel or Dynamo. Along with the website, Flux provides plugins for these solutions. As we work in our favorite design tool, we use the Flux plugin to upload or download data to or from the Flux central server. Flux is organized around projects, each project containing a set of Data Key. These Data Key store values retrieved from Excel, Dynamo or Grasshopper. We can’t edit these values directly in the Flux interface, but we can display them in the Data View. Once in Flux, Data Keys can be linked together in the Flow. This interface displays a visual programming language to transform data as they pass through Flux. The initial tutorial shows us how to exchange data between Excel and Grasshopper. After going through this starter project, I give a try to the Dynamo plug-in. I develop upon a common workflow, where an HVAC engineer retrieves MEP spaces location and area from a Revit model and define in Excel a set of values to be uploaded in Revit. For the sake of this experience, I am using the Specified Supply Airflow, but this should work with any value, such as the occupancy of a room or the section of a duct. I am using here one of my project, which contains a thousand MEP Spaces, and retrieve some of its parameters in Dynamo. Using the GetParameterValueByName node, I retrieve four lists for spaces names, numbers, areas, and levels. The Flux plug-in for Dynamo presents itself as a set of six nodes and allows us to select a project, find data key in this project, and get or push values from or to Flux. I connect my GetParameterValueByName nodes to the ToFlux nodes, and these values are uploaded to Flux. I open a new Excel spreadsheet and use the Flux plugin to create three columns, for Name, Number and Area of the MEP Spaces. Flux automatically fills the spreadsheet with the values retrieved in Revit. I create a fourth column for Specified Supply Airflow and fill in some airflow values. As I hit enter, these values are uploaded to Flux and displayed in the Data view. 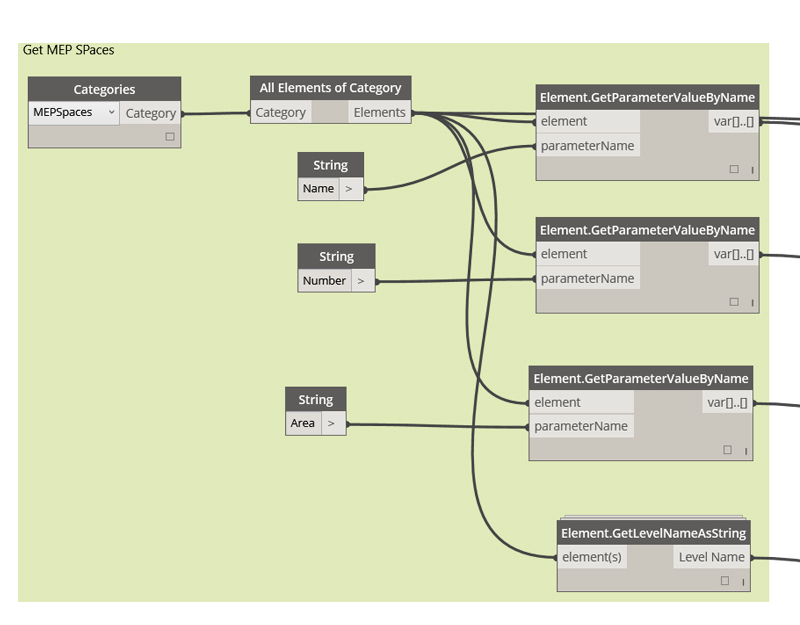 Back in Dynamo, I create a third group of nodes and link the FromFlux node to a SetParameterByName node. This completes the loop and every Specified Supply Airflow values defined in Excel are added to the MEP Spaces. The entire workflow takes some time to set up, but the result is pretty impressive, and I see many possibilities around this kind of web-based exchange. Flux also integrates the possibility to upload geometry created in Grasshopper or Dynamo, and I still have a lot to test with this new tool.